Our history is more than worthy of a mention at this point. Formed in 1922, the IWA, rejected the direction of Bolshevism, having seen its authoritarian nature. Members of IWA Sections around the world fought against the rise of fascism and other authoritarian regimes, presenting the working class with a radically different vision of how society could be organized. One that millions of people actually fought for, with hundreds of thousands losing their lives or their freedom. 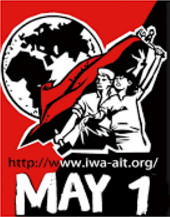 Taking all this into account, we can say that the internationalist IWA was one of the most significant mass anti-fascist movements, if not the most significant one of the time. Now is the time for revival. We must never forget that we offer an attractive ideal for the working class – not only a tool for economic improvement. Yet our relevance as a class organization also depends on our ability to reach those who come from outside political and libertarian movements – especially to reach those who may otherwise fall into the manipulative ideological grip of the elites behind the authoritarian, nationalist right wing movements. We have no time to waste. The future depends on it. This May Day, let our voices be heard, in opposition to the growing nationalist and fascist trends. And every day after, we must build our resistance, on the streets, in the factories and in our fighting organizations.